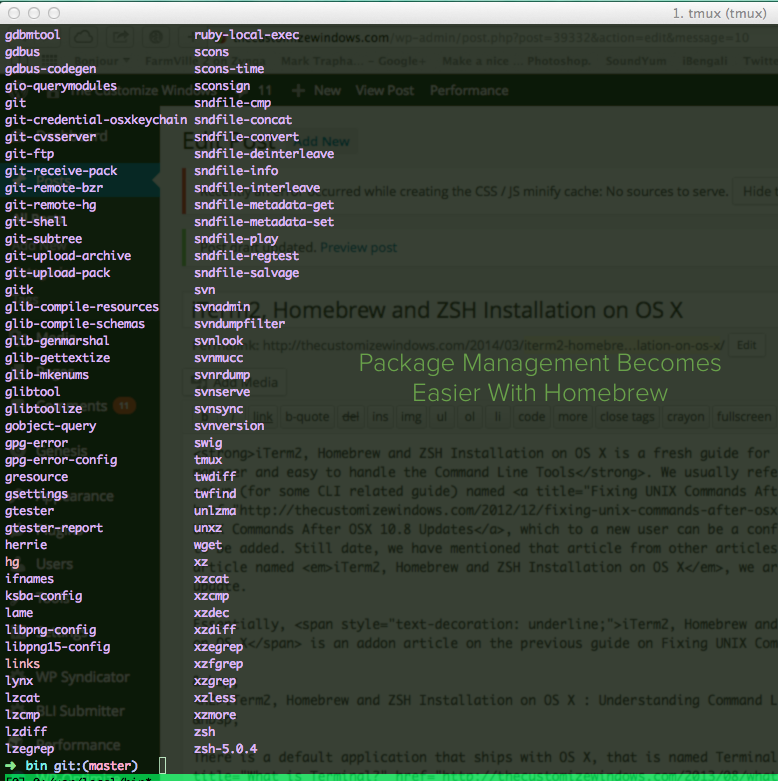 iTerm2, Homebrew and ZSH Installation on OS X is a fresh guide for new OS X users to use a good package manager and easy to handle the Command Line Tools. We usually refer to another old guide for proper setup (for some CLI related guide) named Fixing UNIX Commands After OSX 10.8 Updates, which to a new user can be a confusing title and some more points needs to be added. Still date, we have mentioned that article from other articles, however with the publication of this article named iTerm2, Homebrew and ZSH Installation on OS X, we are not retiring that old post from update. Essentially, iTerm2, Homebrew and ZSH Installation is an update itself on OS X is an addon article on the previous guide on Fixing UNIX Commands for the new computer users. There is a default application that ships with OS X, that is named Terminal App. One must understand What is Terminal – a terminal console and a computer is for input and display of data. Terminals have been developed so far for the mainframe computers and a Physical Machine. So, we need to emulate via GUI – that is what is explained here in the article Terminal Emulation and Terminal. When you are using the latest OS X, you are using UNIX Operating System. UNIX is 40 years old operating system, adapted by Apple Inc. for their Computers named Mac. Manufacturing and delivering computers in this way was the normal rule before Microsoft distorted it with Windows (original) and Windows NT OS. Now, understand what is Unix Shell or simply Shell. One can become confused with the word Command Line Interface or CLI . Take that this CLI means some Shell – it can be ZSH, tmux, Bash or Terminal on Linux. Now, coming to Homebrew – Homebrew is a Package Manager. We suggest to install iTerm2, we do not force the users to must install it or claim Apple’s Terminal is worse than iTerm2. In other words – both iTerm2 and Terminal actually serves the same work, however iTerm2 is more feature rich and is regularly updated. Unless otherwise needed, in this website, using command line on OS X is equivalent of using this software not Terminal App. thereafter proceed to Customize iTerm2 with Color Schemes, Syntax Highlighting. At this point, probably you need to know about $PATH Variable. Now, you can follow the instructions from the subheader Fixing UNIX Commands After OSX 10.8 Updates – Steps from the previous guide. This Article Has Been Shared 2598 Times! Cite this article as: Abhishek Ghosh, "iTerm2, Homebrew and ZSH Installation on OS X," in The Customize Windows, March 2, 2014, April 25, 2019, https://thecustomizewindows.com/2014/03/iterm2-homebrew-zsh-installation-on-os-x/.